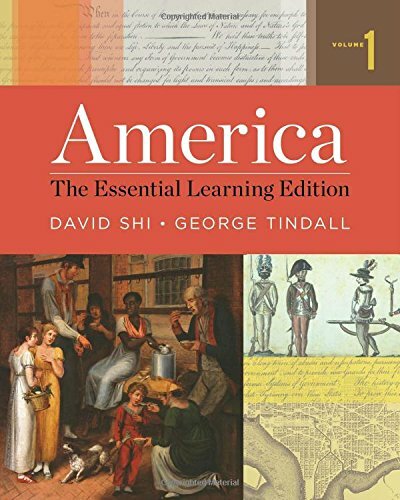 Lively yet concise, The Essential Learning Edition of America blends Shi and Tindall’s unrivalled narrative style with innovative pedagogy to help students understand major historical developments and strengthen critical interpretive skills. Online adaptive learning tools enhance and assess students’ mastery of the core objectives from the text. David Emory Shi is a professor of history and the president emeritus of Furman University. He is the author of several books on American cultural history, including the award-winning The Simple Life: Plain Living and High Thinking in American Culture and Facing Facts: Realism in American Thought and Culture, 1850–1920. Jonathan Lee (San Antonio College, Texas) served on the American Historical Association/Lumina Tuning Project and educational commissions in the state of Texas to establish discipline-wide historical learning outcomes. He received the “Most Inspirational Professor” award from Phi Theta Kappa Beta Nu. He is the coordinator of the Honors Academy at San Antonio College. Tindall, George Brown, Shi, David E.